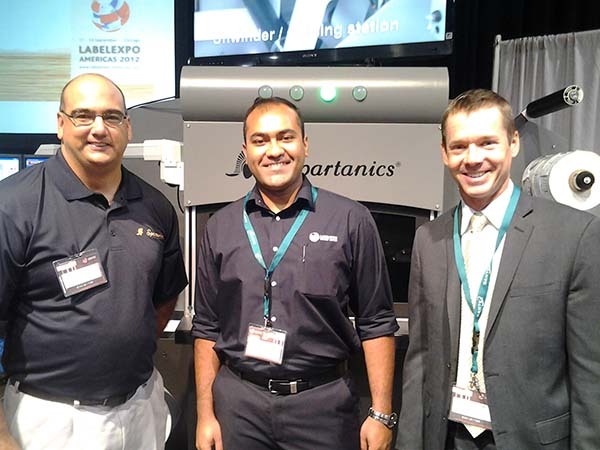 Rolling Meadows, ILL., USA – (August 28, 2013)- Laser cutting machinery leaders, Spartanics, will be showcasing their in-line and offline laser cutting solutions at the 2013 Labelexpo Europe Show in Brussels . Spartanics (Stand #9G38), celebrating 50 years manufacturing die cutting systems, is anticipating their biggest presence yet in Europe with a new technology unveiling . Spartanics will showcase two of their latest innovations for the label, packaging and converting markets; the Spartanics L350 Laser Cutting Machine and the NW140 UV Inkjet Digital Narrow Web Press. The Spartanics L350 is a modernized laser cutting system that can cut configurations on the fly with speeds up to 100+ meters per minute. One of the most fascinating capabilities of this cutting edge technology is the amount of flexibility it offers to the market through converting options, such as: UV Coating, Rotary Die Cutting Station, Rotary Sheeting, Hot Stamping, Lamination, Knife Slitting and more. The L350 is also equipped with Spartanics Optimization Software and XY registration, as well as, bar code automatic changeover capabilities. The NW140 UV Inkjet Digital Narrow Web Press powered by JETInx will also be showcased in the Spartanics Stand (#9G38). This system offers an all in one solution for today’s print and label converters. It comes equipped with XAAR 1001 Print heads that offer 6 channel print modes, including: White, CMYK and Clear Varnish. The affordable NW140 prints jobs in line with the Spartanics X140 Laser Cutting Station. This system comes complete with low heat UV LED Pinning and Curing lamps, as well as, environmentally friendly inks. Spartanics laser cutting technology will also be featured in the Durst Stand #9H57. Durst and Spartanics have integrated their expertise and technology to engineer one of the finest additions to the market; the Durst Tau 330 UV Inkjet Digital Label Press with In-Line Laser Finishing System LFS 330 and it will be unveiled at the 2013 Labelexpo Europe Show! This advanced technology is able to operate as a fully integrated in line solution, as well as, an offline system. The Durst Tau 330 UV Inkjet Digital Label Press is capable of printing at excessive speeds of 157 linear feet per minute and offers flexible converting options. Labelexpo Europe attendees are all encourage to stop by the Spartanics Stand #9G38 and the Durst Stand #9H57 to watch live product demonstrations and meet with the top engineers of the industry. Experts from both companies will be on hand to answer any and all questions pertaining to the laser and digital technology offered in today’s marketplace. This is going to be one show that industry leaders will not want to miss. For all sales and product inquiries please contact Mike Bacon, VP of Sales & Marketing at Spartanics,(866) 540 5526, FAX (847) 394 0409, Email: sales@spartanics.com.